Outdoor advertising is at least 5,000 years old (the ancient Egyptians used to hang papyrus notices advertising rewards for runaway slaves), and fears about how invasive it could be have been around nearly as long. For every glitzy video billboard you curse at today, know that your forbearers dreamed up much, much worse. Drive through just about any populated area in the U.S. and you'll see billboards dominating the landscape. Ads for beer, restaurants, movies, strip clubs and scary tea kettles all share the same space in my neighborhood. The ads all desperately demand your attention in the form of huge traditional billboards that tower above the street, bus stop displays that attempt to seduce the pedestrian at street level, and so-called "wild postings" that pop up on construction sites and abandoned buildings. We even have some "supergraphics," a controversial type of billboard that overtakes the entire side of multi-story buildings and parking structures. However contentious a topic outdoor advertising has become, it's hard to imagine the major cities of the world without it — unless you're in Vermont, which has banned roadside ads since 1968 — be it large billboards, small posters or even sky-writing. But in the late 19th and early 20th century, just as outdoor ads began to take the modern forms that we're familiar with today, popular magazines of the time lampooned the increasingly innovative ads that were being unleashed upon the new American consumer. The image above came from an 1891 issue of Life magazine and depicted an "American landscape of the future." The corsets and trunks being advertised may have gone out of style, but the true anachronism appears to be this future couple's mode of transportation — there's not a single car in sight. The image above comes from a 1904 issue of Life magazine and predicts the ad-dotted skies of the future. As powered aircraft were becoming a practical reality (the Wright Brothers had just taken off the previous year) dreams of advertising on flying machines in the sky seemed more and more likely for the future. This illustration appeared in an 1893 issue of Life magazine and showed the sky-writing of the future. Pants and soap seem reasonable enough, but advertising cigarettes probably wouldn't go over so well here in the year 2013. 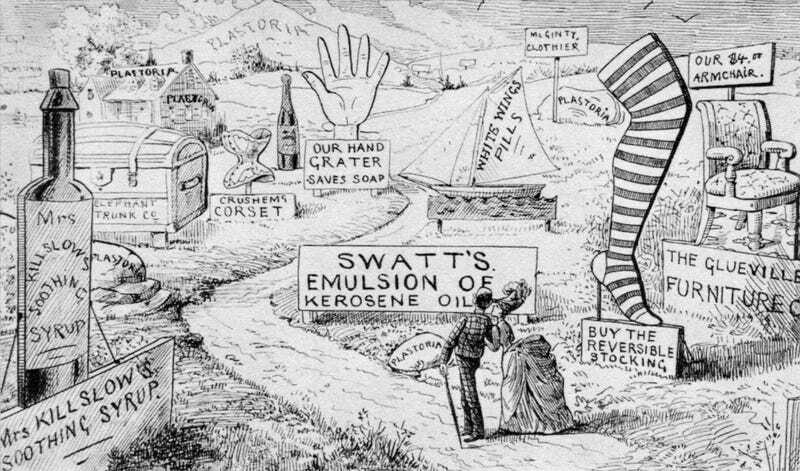 According to the cartoonists of the late 19th century, nothing was sacred nor spared from the advertiser's message. Not even the Statue of Liberty. This illustration ran in an 1885 issue of Puck magazine, the year before the sculpture was even erected in New York City. The Statue of Liberty wasn't exactly a sacred symbol of freedom in the 1880s, but it's a pretty jarring image for Americans living the 21st century. Few things more dramatically altered the size and character of outdoor advertising than the car. The speed of the car meant that billboards had to get much larger — with easy-to-read, bold lettering and in many cases brightly colored graphics. The illustration above was published in a 1917 issue of Life magazine and bemoaned the recent surge of huge outdoor ads brought on by the automobile. Soon, they thought, you'd have to pull over and grab a ladder just to take in the scenery. In some areas of the country, I wouldn't say their prediction was altogether wrong. All images were scanned from the 1956 book Predictions by John Durant.